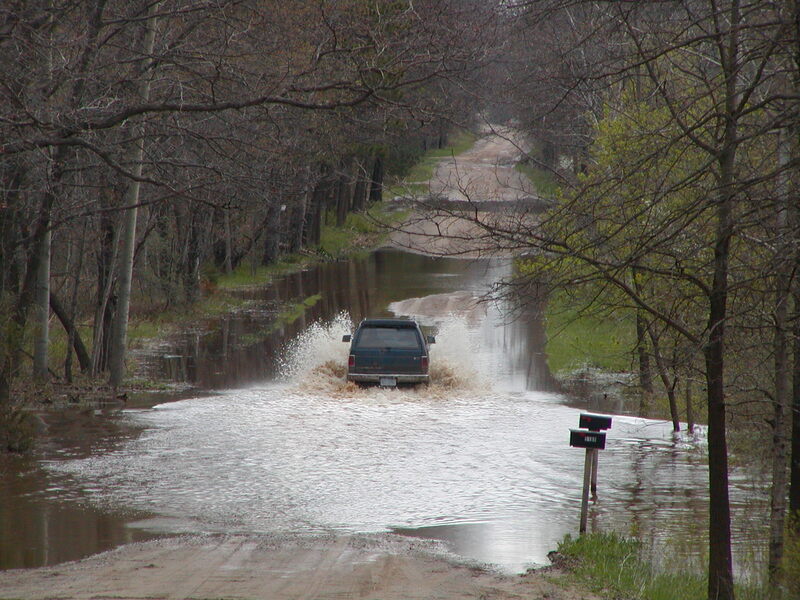 It’s been a rainy weekend here on the homestead. But that’s okay with me as I know that our newly planted fruit trees, transplanted perennials and vegetable garden seeds all need this life-giving water to thrive. We had 3.1″ of rain in the last two days which will also helps our two water containment totes to fill back up as well. Native lupines in my white pine bed at the Small House pole barn driveway. What do you do on a rainy weekend? We clean house! 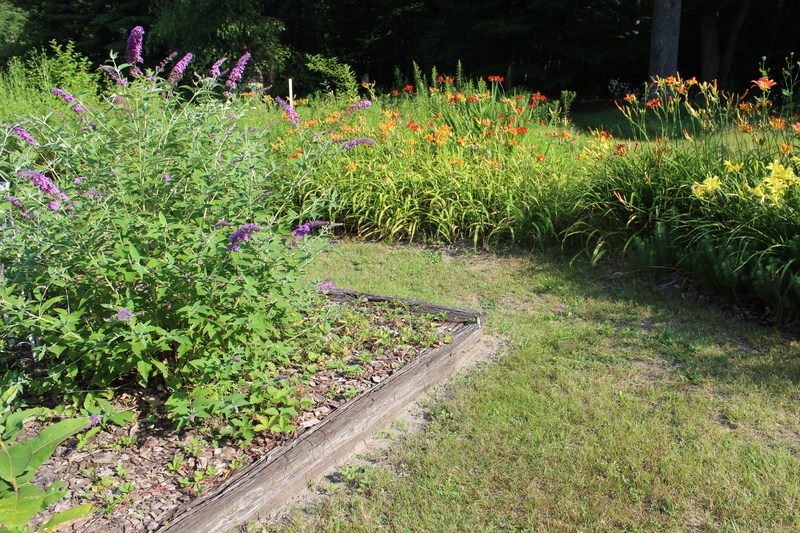 This pine bed filled with lupines and catmint greets our friends and family. Since taking photographs of cleaning house will be boring I will share spring garden photographs I have taken during the last couple of weeks. 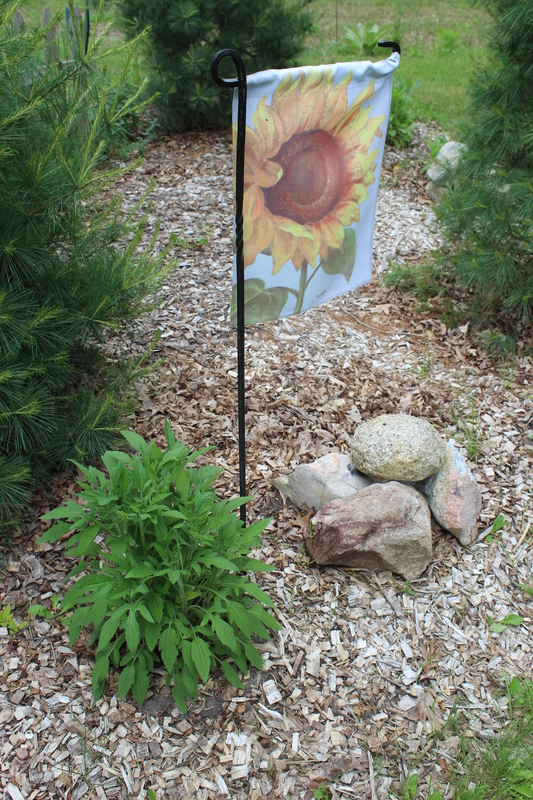 A colorful sunflower flag helps to brighten a gray sky week here. This time of year we spend almost every waking minute working out-of-doors or with our animals so the house, unfortunately, often gets left behind. And recently with so much of my time and energy going towards the replacement of the porch roof and the insurance claim for the same room, cleaning time has been a precious commodity of late. 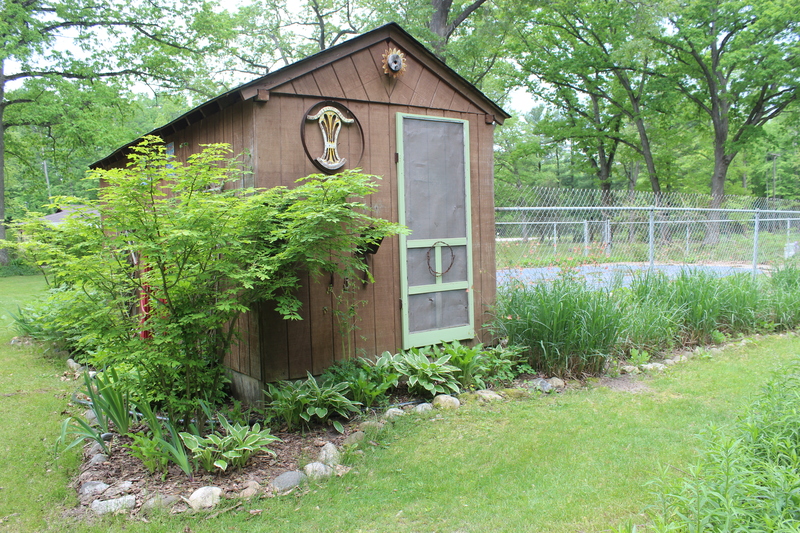 The hostas are up at the pool shack – the ornamental grasses are starting to. So I talk advantage of these days to do a thorough cleaning. And boy does this house need it right now! 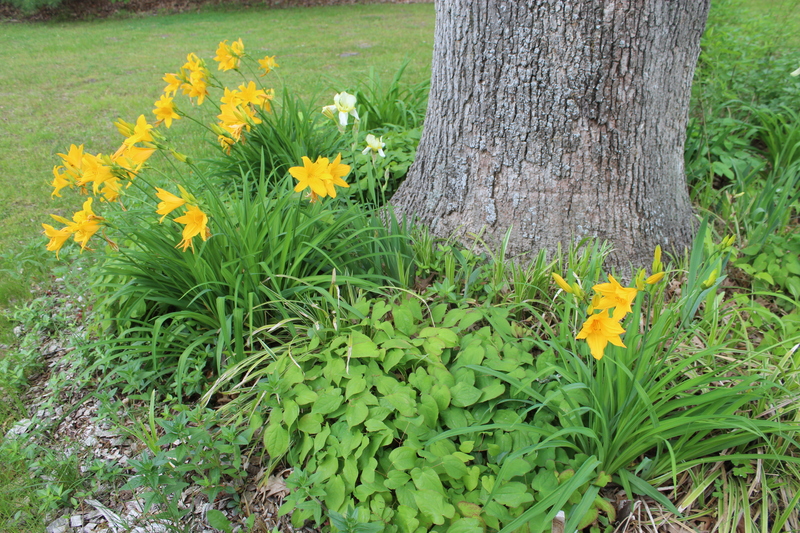 Scented day lilies and epimedium under a White Oak tree. Today Gene will clean the bathrooms and kitchen and vacuum and mop the floors. I’ll feed the animals, change out the chicks litter and vacuum the bedroom carpets and our many area rugs and the fine tuning details he is likely to forget. We will both also take the recycling to the compost station today and run the dog. Then I’ll be cooking up a storm. 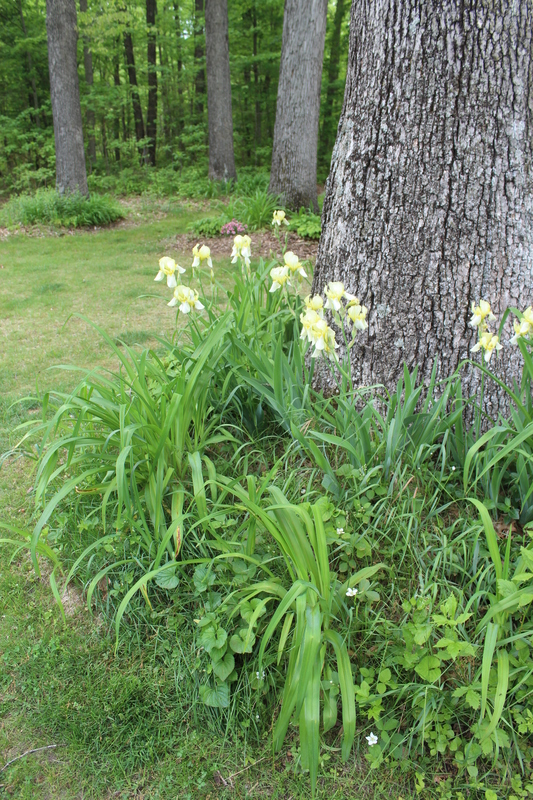 Light yellow iris’ in a bed under another White Oak tree. Together we will get this job done, as partners as we always do everything. I am thankful for having Gene as my partner. 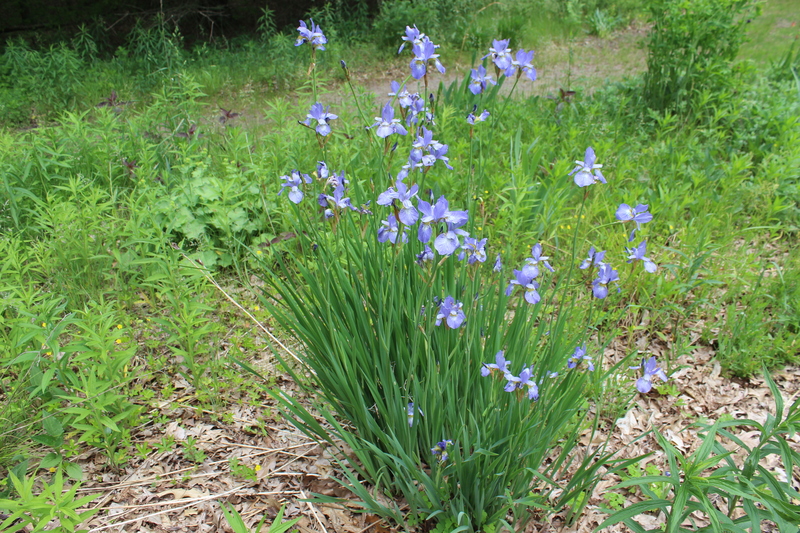 Japanese iris in our meadow. 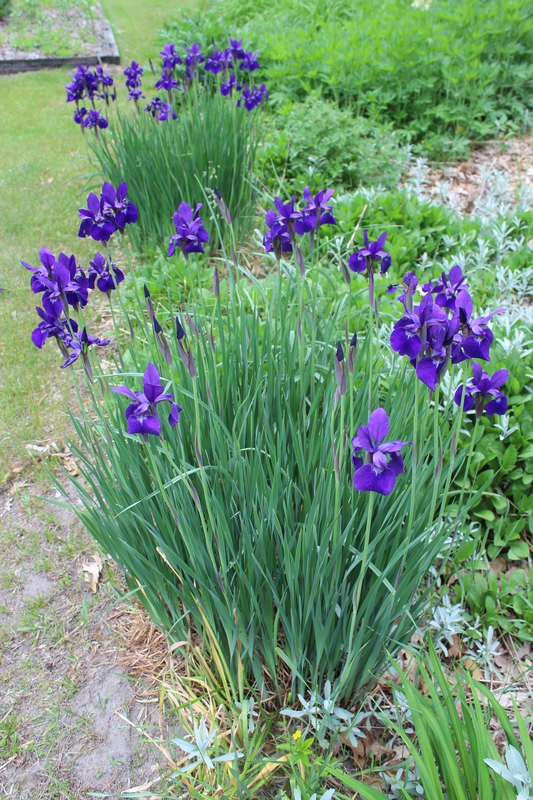 This lavender iris is a pass-along plant from a gardening friend. It always feels SO good to me to be in a very clean house. Our home in the middle of a marsh or maybe it actually qualified as a small lake? 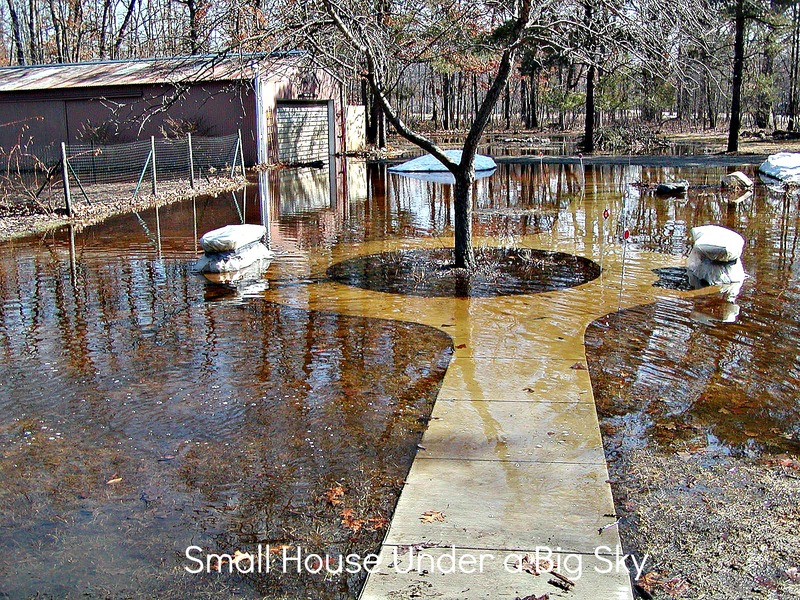 Those of you who have followed this blog or its predecessor, The Small House Under a Big Sky.wordpress.com might remember my post about our years of ground water flooding. It was a very stressful time for me in which after four years of serious flooding, I began to despair over ever having my old life back. 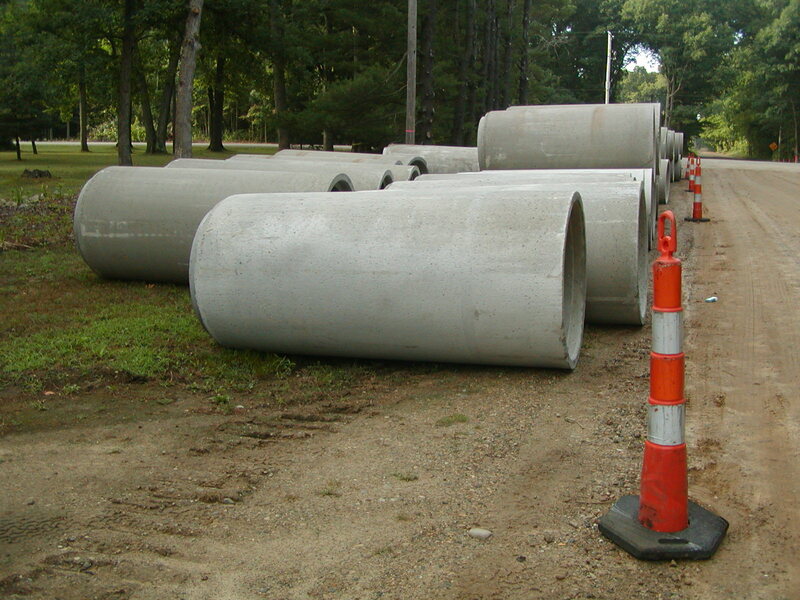 We lost our trees so that these cement drainage pipes could be put in to move the water away. The roadway beside our home. You can see why we had no choice in order to save our home! And we had to pump out our crawl space, 24/7 for months at a time and someone had to be home at all times and that someone was often me. I was not sleeping and when I did drift off in exhaustion, I would wake at night after having nightmares of my home floating away in flood. 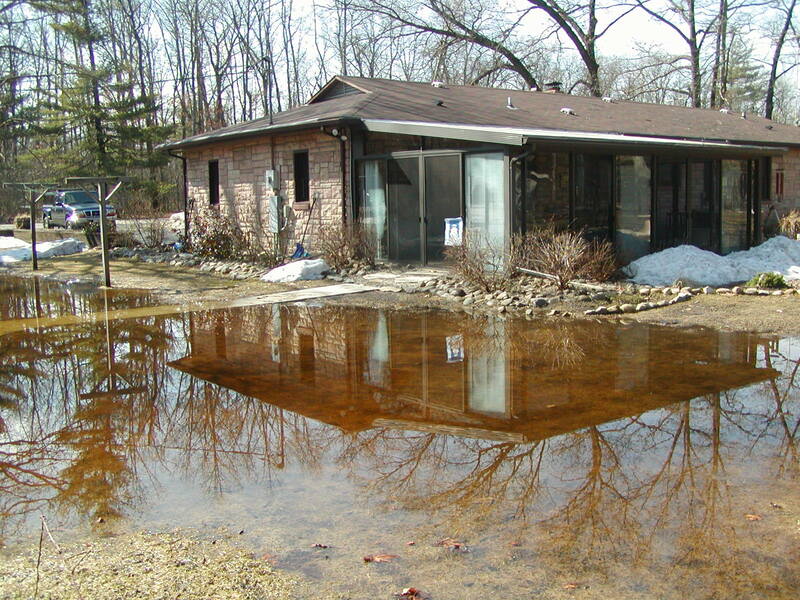 I also became very sick from the high levels mold and mildew in our leaf mold mulch surround our homestead. And we could not plant our vegetable garden for four springs and when we finally could, I found all of our good soil washed away. Please believe me when I say, it was a totally depressing period! The flood at its peak covered our sidewalk, killed our crabapple tree and rotted hundred of daffodil bulbs planted below it. Prior to the ditch being dug and our beloved 100-year-old trees cut down to make way for big equipment (I cried!) 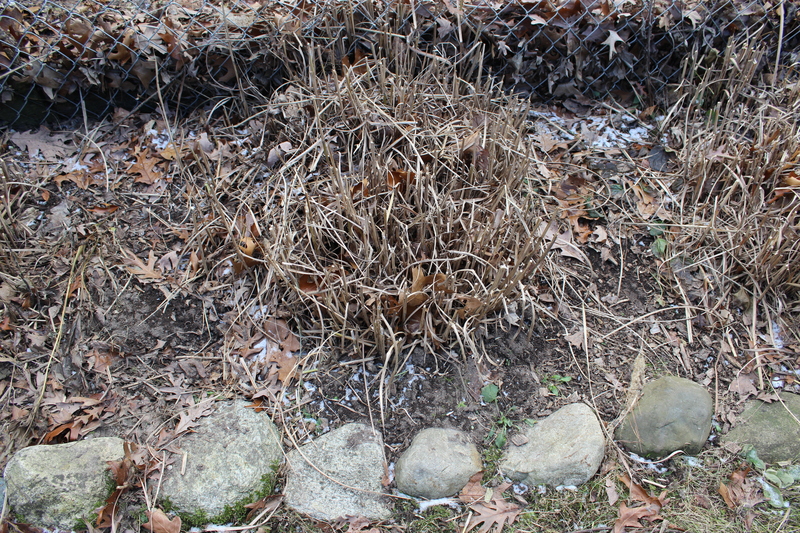 I had to dig up and pot hundreds of plants and keep them alive for two years until they could be replanted. 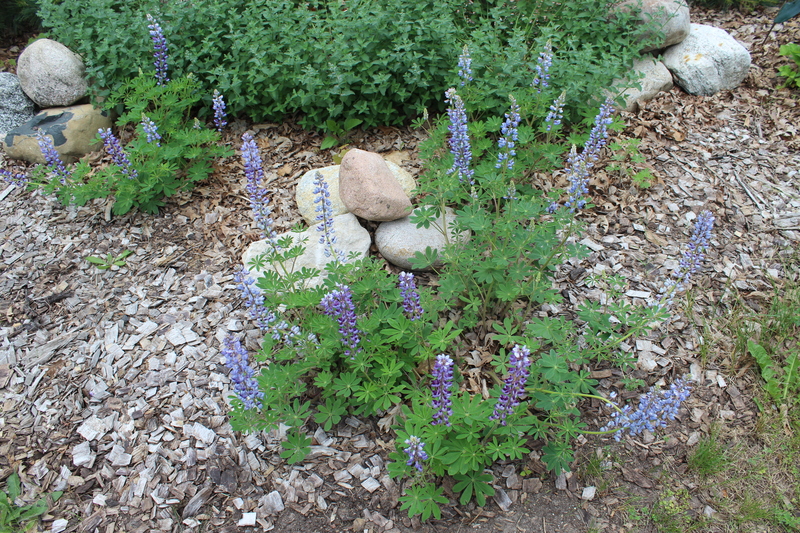 Many, like the native deep-rooted purple lupines cannot be transplanted and all were lost. Twenty-five-feet of our trees and shrubs had to be removed to make way for the ditching project and the heavy equipment it took to do the work. 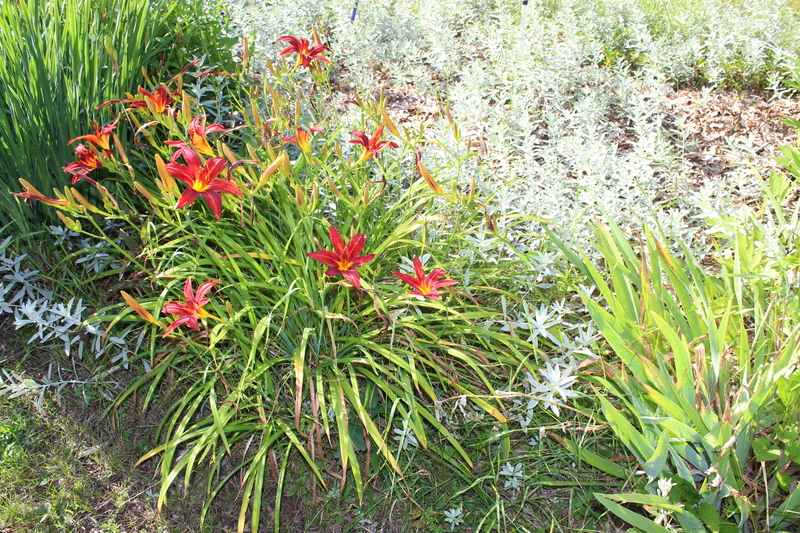 My gardening style is loose, full and cottage like – no perfectly groomed rows of shrubs for me. 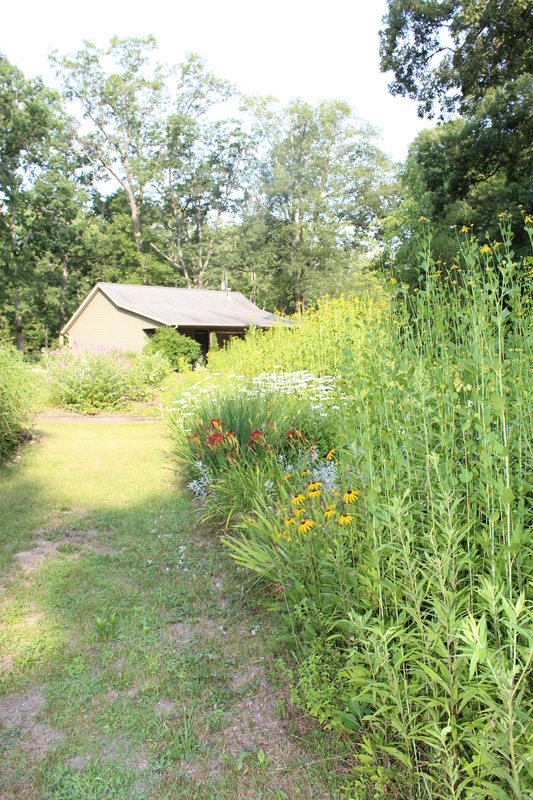 I prefer native plants as pollinators because its better for the ecosystem and because they just live better with less work and less watering needed. 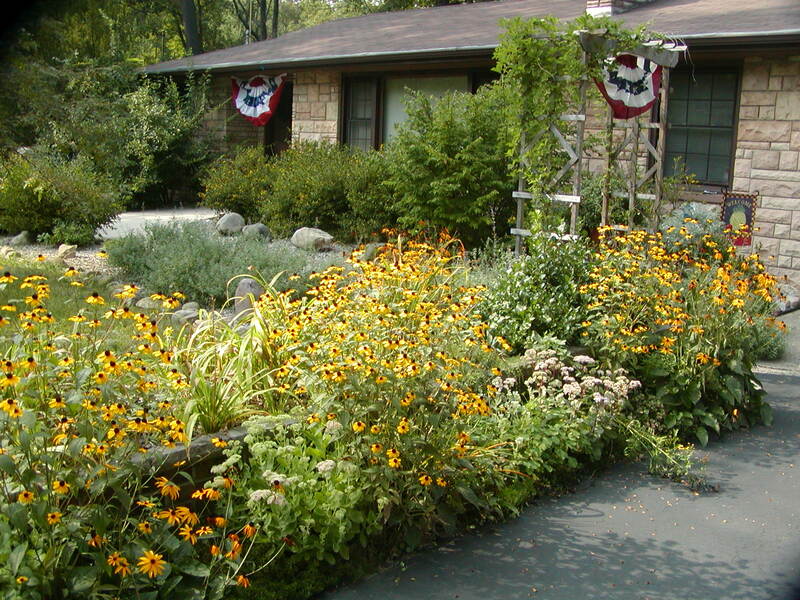 This is my wild & flowing cottage gardening style next to the driveway of our 1950’s ranch style home. Once the ditches were installed they were so barren and ugly I cried, again. 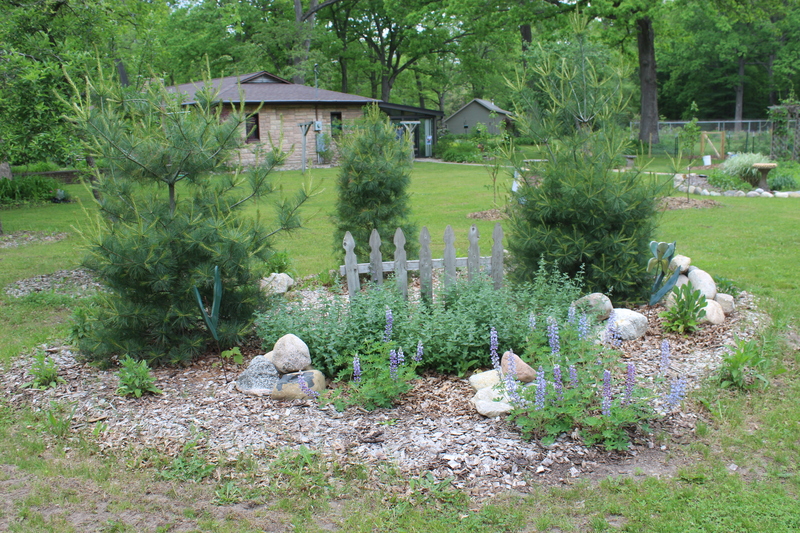 I missed my majestic White Oak trees, dogwoods, lupines and my beautiful yard and garden. At that point I was willing to try anything to boost my spirits. 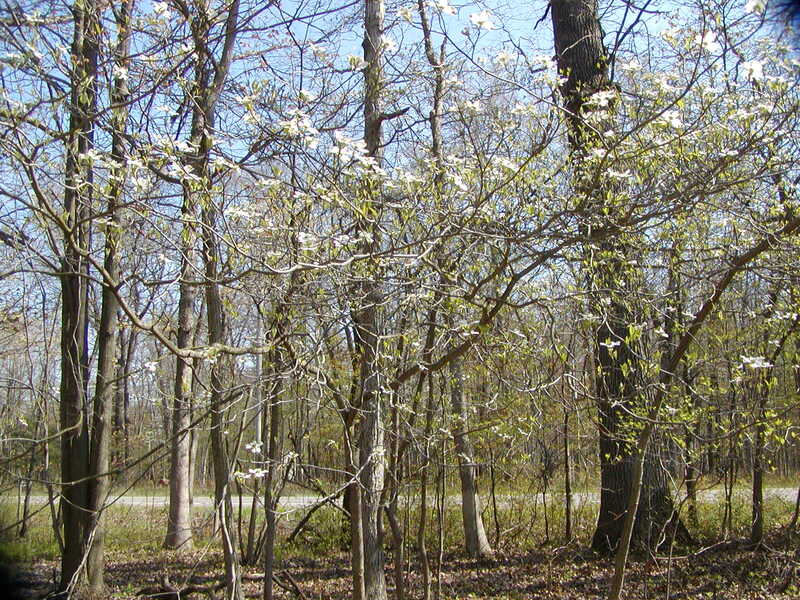 This is our wood lot where we had many native dogwood trees that bloom each spring. This tree line was so beautiful in the early spring but they are all gone now due to the counties easement area of 25 feet to make way for the ditches. In desperation I began to throw wildflowers seeds into the ditch a section at a time. I have a lot of Brown Eyed Susan’s that I cut back in the fall so these became one of the primary seeds that I threw into the ditch. 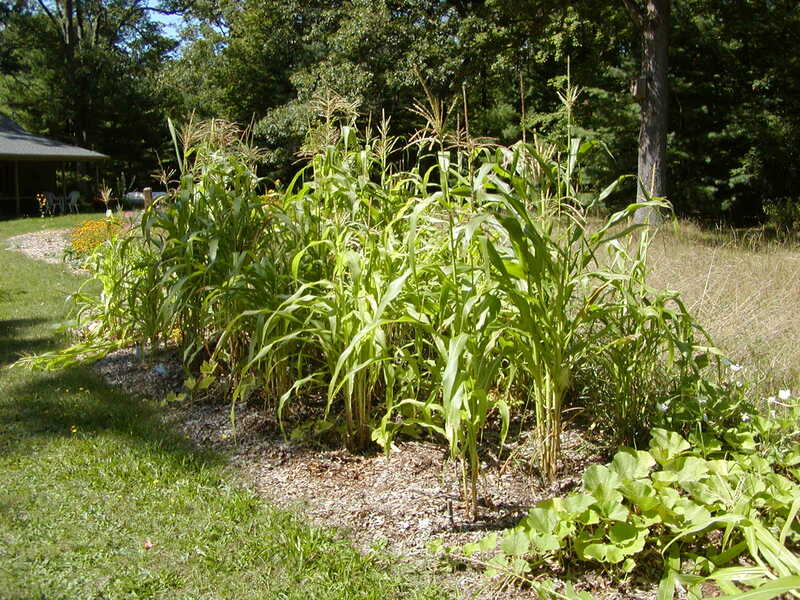 Any seeds that might take were thrown into the ditch several years running. 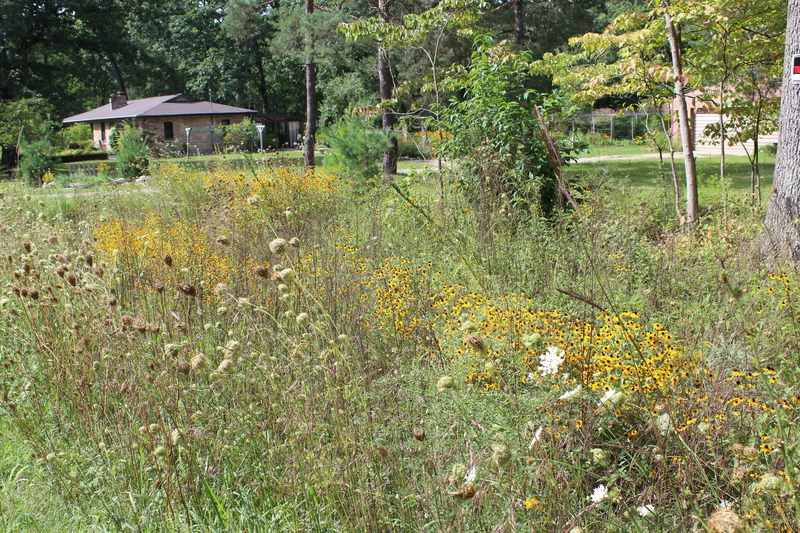 The Brown-Eyed Susan’s and wild carrots, goldenrod and others plants ablaze in our ditch. 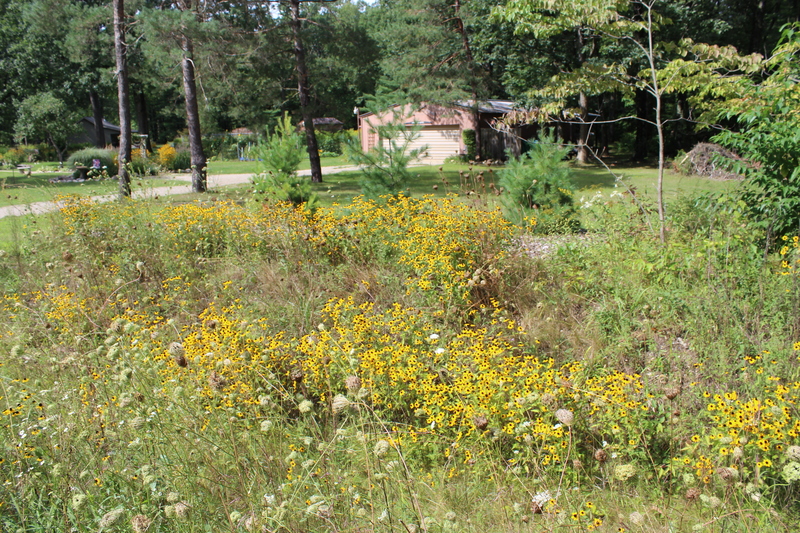 This is the result of that Johnny Appleseed approach to making the ditch prettier! 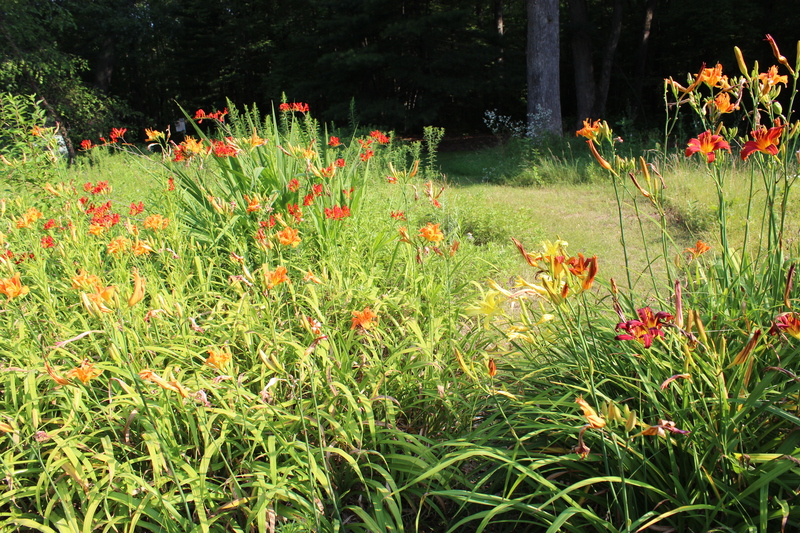 After the darkest of days comes…a wildflower bonanza! 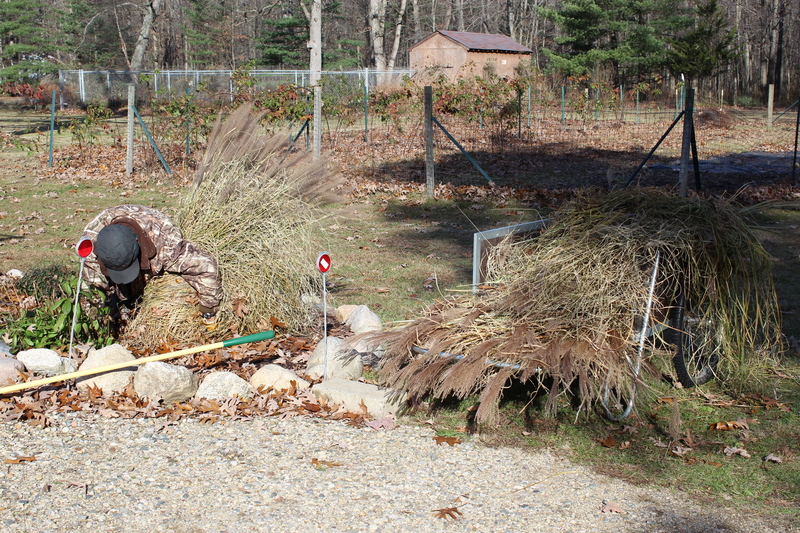 These grasses were cut down this weekend to complete our fall garden chores. I was up with the chickens this morning and washed a load of perma-press clothing, fed the chickens, posted a story on our blog about our homestead and baked a black raspberry crisp to have with our lunch today. The crisp is a special treat for my husband for our 18th anniversary that we celebrated on November 30th. In addition to making him happy, there is a great deal of satisfaction in knowing that these tasty berries are our own black raspberries from our garden patch that I picked and froze last summer. 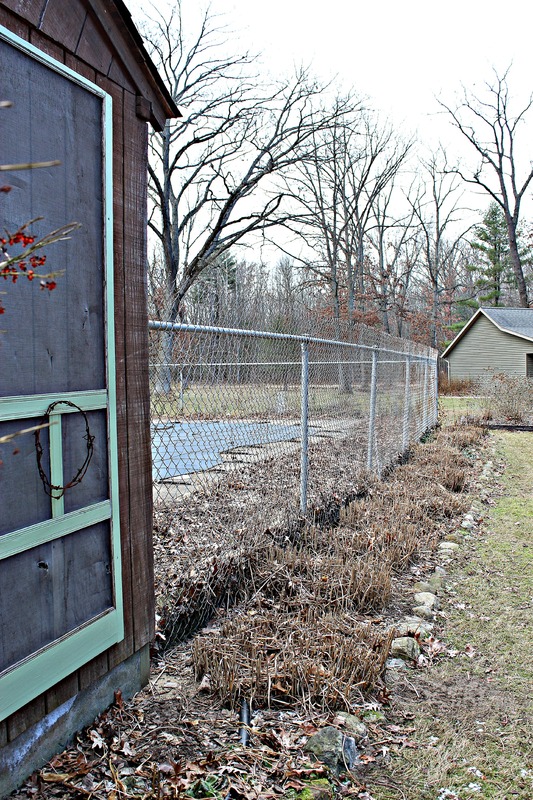 A December snapshot after the grasses have been cut down at the pool shack. Gene shoveled the driveway while I cleaned out the chicken coop and began our lunch. I am making Alaskan salmon patties to have with left over sweet potatoes and a tossed salad today. Gene popped Sassy in the truck for her run and combined a trip to the recycle stations while I swept the floors. Our plan is to get to work on the outdoor project this afternoon that was delayed due to the snow. Taking advantage of the snowmelt to cut back the ornamental grasses. With winter coming on so early this year combined with our two-week long get-away trips we did not finish all of the outdoor garden work. So today when the weatherman predicted a 30 to 40 degree warm up with sunshine we decided we had better get right on cutting down the last of the ornamental grasses. 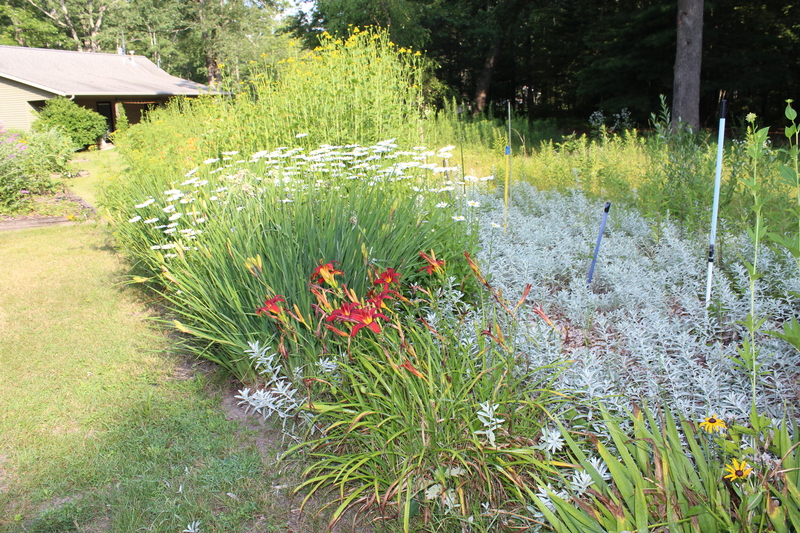 The side garden at our simple and basic farm-stead type swimming pool. 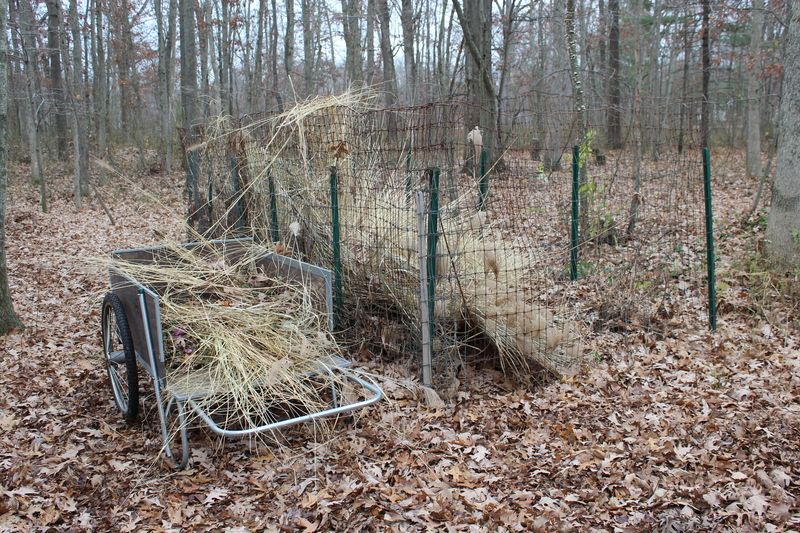 I know some gardeners leave the grasses up all winter for interest and for the birds to eat their seeds but over the years we have found it works best for us to cut ours down in the fall. 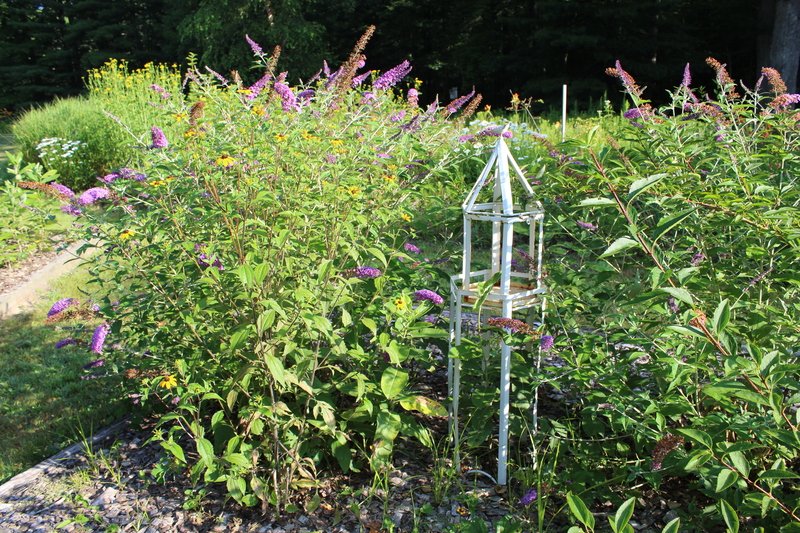 The songbirds have plenty to eat at our year-round bird bed & breakfast bar! This is our big compost bin where we toss the tougher grasses to compost. They often take two years to break down. 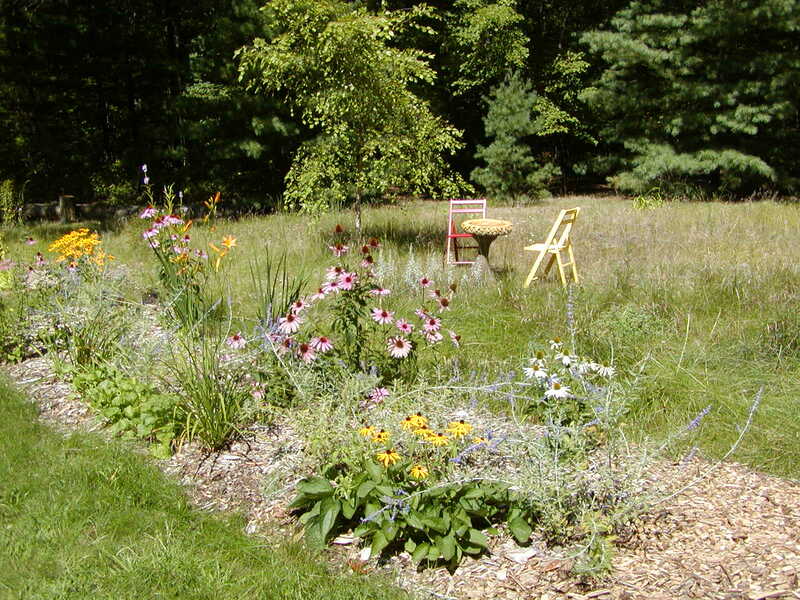 Our Vermont Cart is indispensible for such garden clean up projects. Here in the land of 6 ft. snowfall the grasses tend to get beat down anyway from the heavy snow fall. While I am more of a cut them down with your hands kind of person, Gene prefers to saw them off with the electric hedge trimmer. It’s a guy thing! He wraps them in a rope, saws the canes off and I toss them into the Vermont Cart and haul them off to the larger compost bin. 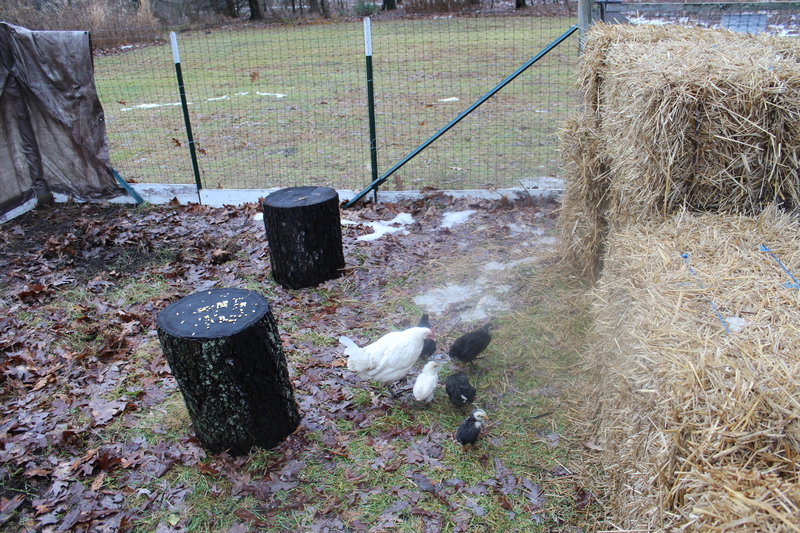 The chickens free ranging in their fenced in pen. I let the chickens out to free range and we began the garden project. Micanthensis Sinsethisisa favorite type of ornamental grass. If you’ve been following The Small House Under a Big Sky for any time you are likely realizing that our previous blog focus was mostly about our furniture restoration and painting business and it is now changing. 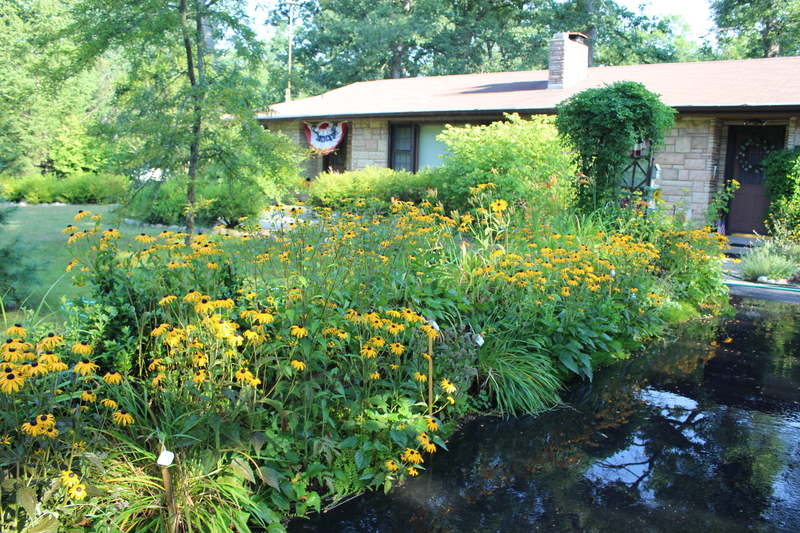 The front of the Small House this past July when the flowers were in full bloom. This blog is evolving because our life is changing too. 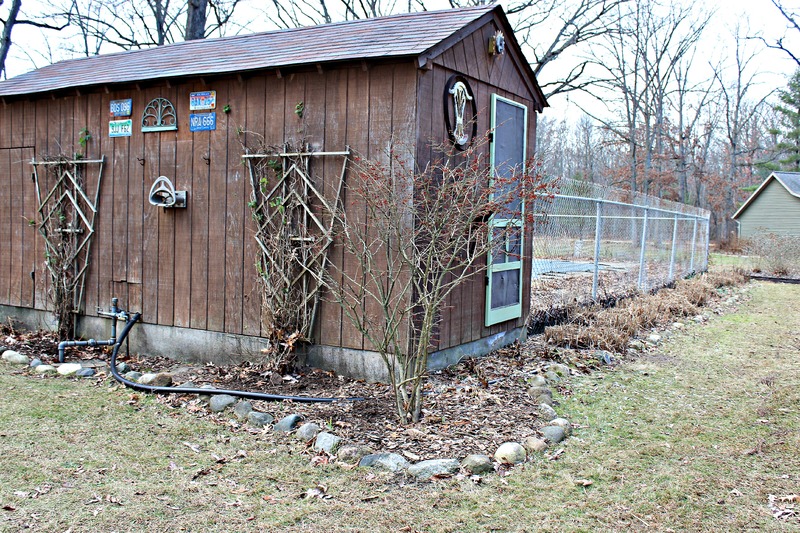 I recently realized that 90% of my time and energy is going into our gardening, our homesteading efforts and living a greener lifestyle. If you look back you’ll quickly realize that we are seeking to live a healthier lifestyle building the fertility of our life while building the fertility of our soil. 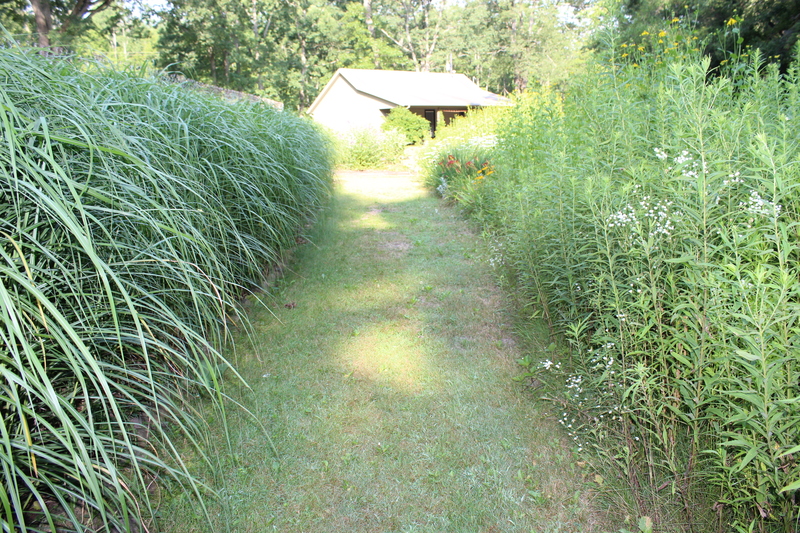 The grass pathway between the meadow garden and the pool. 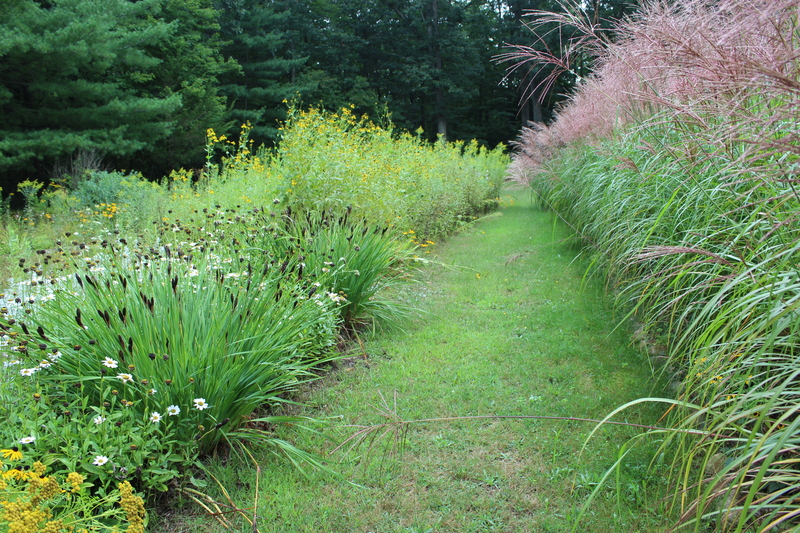 the grasses and seed heads provide food for the songbirds. 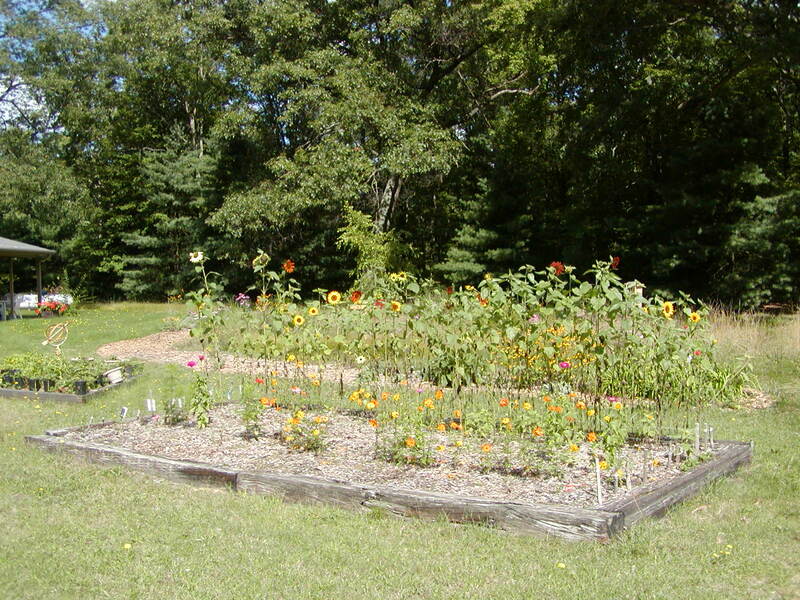 A small garden bed behind our three-season porch overlooks the back yard and our majestic White Oak trees. 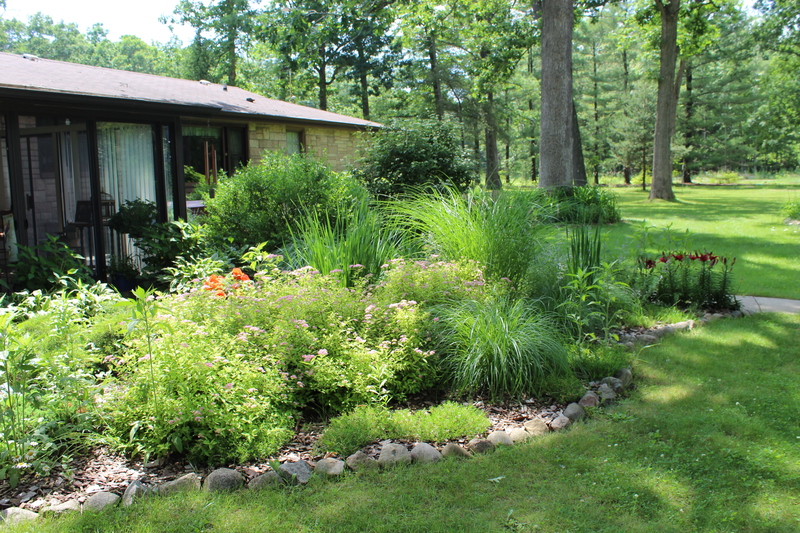 I have recently realized that our life here in this small community in SW Michigan is really all about changing our own small world while creating a sound, native, plant ecosystem and growing better soil and tastier and more healthy food. 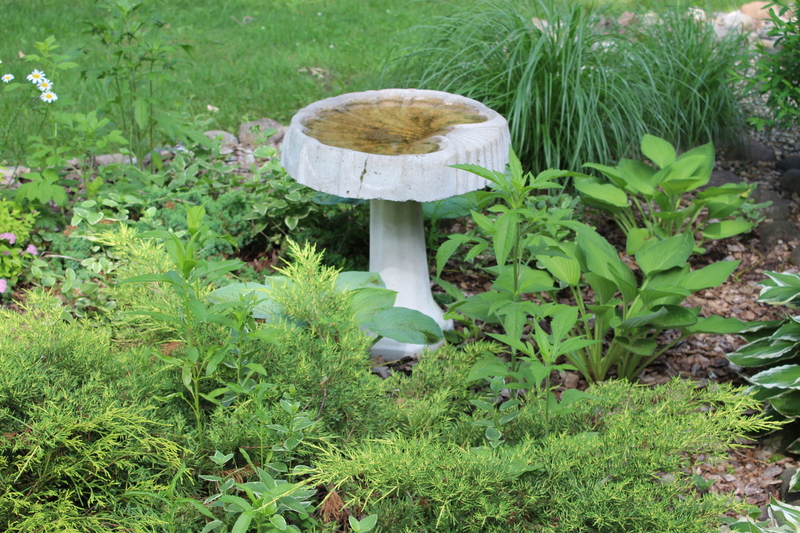 One of four bird bath we monitor that keeps water ready for our songbirds. Yes, I still save, refinish and repurpose vintage furniture but our life is about much more than that. I have dedicated myself to saving our land, to improving our community and our health while creating something larger than ourselves to pass onto another when the time is right. 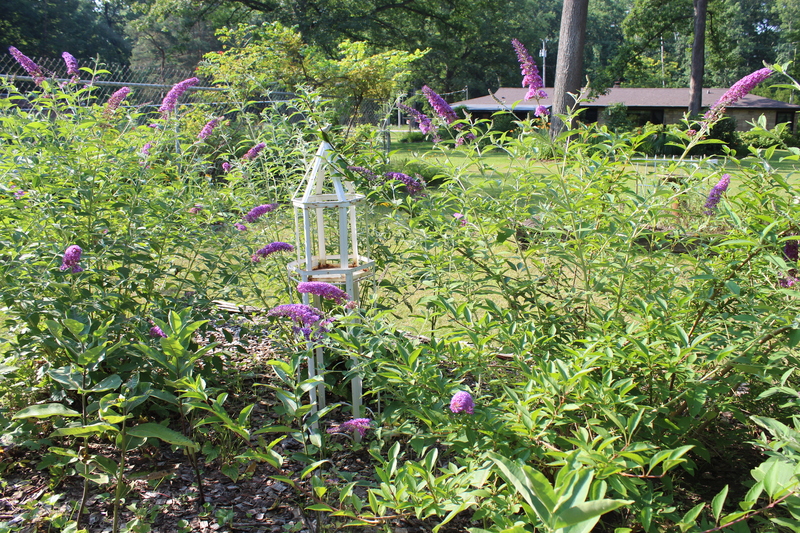 Butterfly bushes in the raised cedar bed sits adjacent to the meadow garden. 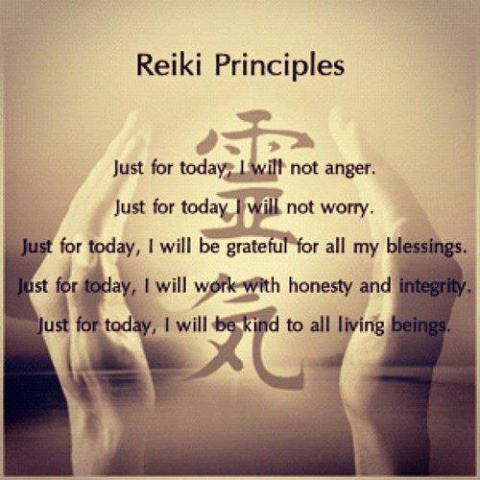 Just For Today Do Not Worry ~ Just For Today Do Not Anger ~ Just For Today Be Filled With Gratitude ~ Just For Today Do Your Work Honestly ~ Just For Today Be Kind To All People. Donna at the Small House Homestead.